Hi there. I've been having a week (month?) where things are just not working out in terms of recipe development and boring, yet important, behind-the-scenes blog stuff. However, I do have this delicious salad recipe that's fresh, flavourful, and pretty healthy for you. 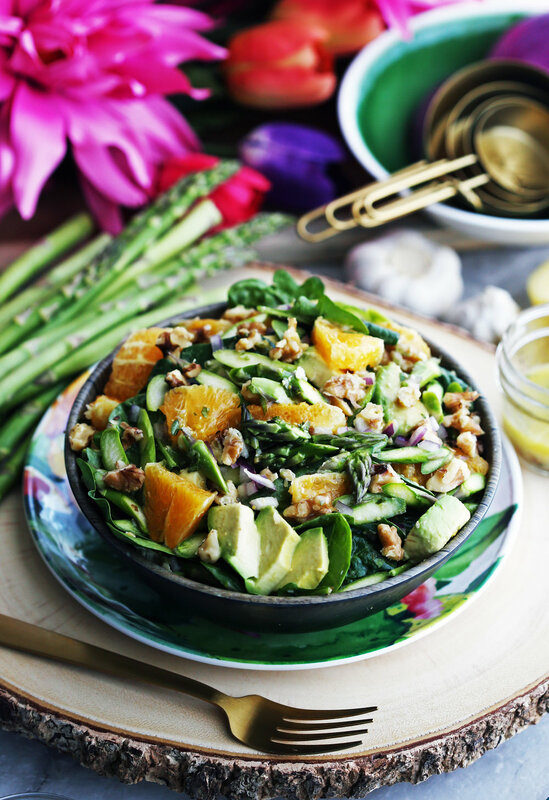 Check out this Asparagus Orange Spinach Salad with Basil Lemon Vinaigrette! Asparagus: These vibrant green spring vegetables have a sweet, bright, earthy flavour and crunchy texture when eaten raw. The longer you cook the asparagus, the more tender it becomes. I like to keep my asparagus tender-crisp as over-cooked asparagus gets too mushy and falls apart too easily making it unpleasant to eat (unless you are making soup with it). Healthy asparagus is one of my top vegetables to use, especially when it’s in season (from February to June). These good-for-you green stalks are low in calories, almost fat-free, high in vitamins A, C, E, and K, and a good source of iron and calcium too. What’s your favourite way to eat asparagus? Raw, boiled, blanched, pan-fried, or roasted? For this recipe, I opted to leave the asparagus in their natural form. What to look for? Since you are eating the asparagus raw, it’s super important to make sure you get the freshest-looking bunch possible. Look for firm (but not woody) stems with bright green or purplish-hue tips that are compact. Avoid flimsy, wilted asparagus. How to prepare? To make the crunchy asparagus easier to eat, slice the asparagus thinly on a diagonal to make smaller pieces. If you have thicker stalks, you can also shave the asparagus into super-thin ribbons using a vegetable peeler. Navel Oranges: They are juicy, sweet, and slightly sour in flavour. This citrus fruit is a lovely compliment to the asparagus. To prepare, using a sharp knife, slice both ends off, and then carefully slice off the skin (along with thick white pith). From there, slice the oranges into sections, rounds, or small pieces (whatever size you want for your salad). Did you know that these seedless oranges get their names from the round navel-like spot on one side of the orange? Each navel orange grows a twin fruit that forms at the opposite end of the stem, but doesn’t develop and hence forms a belly-button like appearance. Also, all navel orange oranges are genetically identical (they’re clones!). They originated from a single (mutant) orange tree from Brazil over 200 years ago. Since they are seedless, they are propagated through cutting and grafting. Substitute with Valencia, Cara Cara, mandarin, or clementine oranges for easy peeling and sectioning if you want. Avocado: This stone fruit is creamy, buttery, and nutty in flavour. Along with my addiction to avocado toast (or bagel), I love including them in a salad for its wonderful texture and health benefits. For example, avocados are a rich in vitamins, C, E, K, and B-6. Baby Spinach: These green leafy vegetables are tender and slightly sweet. We always have a large container of baby spinach on hand for salads and smoothies since they are full of healthy vitamins and nutrients such as magnesium, iron, and folate, as well as vitamins A and C.
Red Onions: Sweet and slightly astringent (that sharp, somewhat spicy flavour in onions). They are wonderful to eat raw in a salad, adding an additional flavour profile to this sweet and savoury salad. 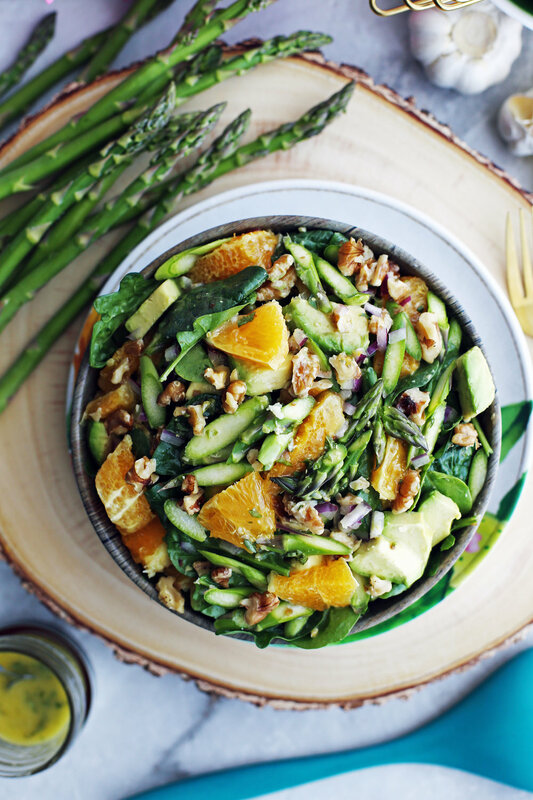 Walnuts: Adds a little crunch to this salad. They are fruity, earthy, tart, and slightly bitter in flavour. A Homemade Vinaigrette: A simple basil and lemon vinaigrette is the finishing touch to this healthy salad. It is a super easy whisk (or shake in a jar) dressing that compliments all the ingredients in this salad. 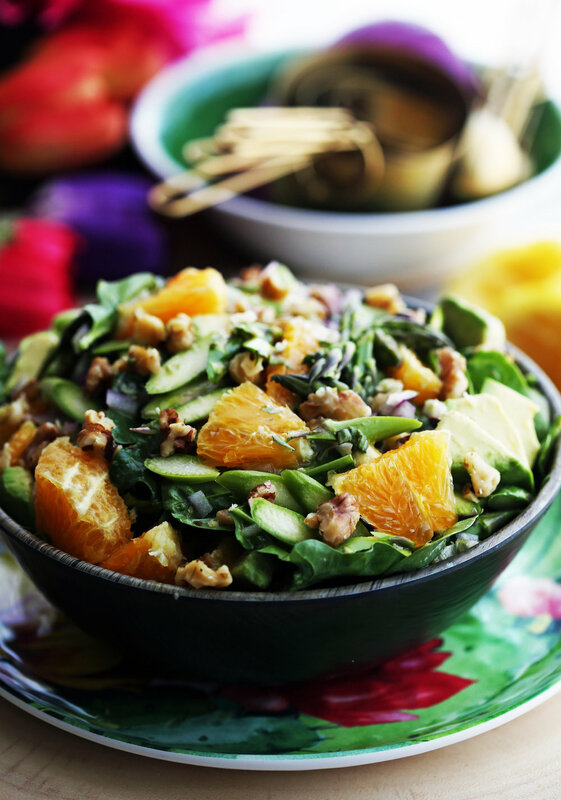 Is delicious: the sweet and savoury flavours in this salad are wonderful. Is healthy: full of beneficial vitamin and minerials. Very quick to make: It only takes about 10 minutes to put everything together. Is customizable: You can always add more or less ingredients to suite your preferences. Uses a homemade dressing: a quick vinaigrette that can be used in other homemade salads. Is vegan and gluten-free too! I hope you try this recipe! If you do, please comment and leave a rating down below. You can also connect with me on my social media by tagging me (I’m @yay_for_food on Instagram). I love pictures of food! In a large bowl, combine the salad ingredients, then drizzle the desired amount of vinaigrette on top. Toss well to combine. Best served immediately. *Substitute navel oranges with 4 mandarin or clementine oranges. If you are planning to have leftovers, keep the salad separate from the vinaigrette and cover both in the refrigerator for up to 3 days. I recommend dicing up the avocado just prior to serving as cut avocado will oxidize and brown if exposed to air. Re-whisk the vinaigrette and drizzle just before serving. Nutritional calories represents one serving for a total of 8 servings.